I’m a prodigious wanderer when it comes to Glastonbury and spend a great deal of my time off on my own, snooping around in little corners of the festival and creating a photographic record in order to both embellish the F.A.Q’s on this website and also to include within my own festival photography galleries. The advice I give within the F.A.Q’s is to only pick 2 or 3 “must see” performances each day, but nevertheless I have to confess that I've been diligently studying Halvin's excellent “Clashfinder” for the last few days & working out a vague plan of the routes I'm going to take around the festival. I did the same thing last year and was surprised at how much I achieved. Assuming the weather is fine, the first thing I would advise anybody to do is to take a wander up to “Flagtopia” where you can get the most unbelievable views across the whole of the site. It’s a bit of a climb but it’s so worth the effort and it really gives the Glastonbury newcomer their first taste of exactly how enormous the festival is. For those who get their tents up early enough and are looking for something to do at 3pm on the Wednesday afternoon you could do worse than popping along to the Pyramid Field to see my good friends Hobo Jones and the Junkyard Dogs. Fresh from their support slot on the recent Levellers tour these 3 men of Kent will astound you with their instrumental dexterity!!! If you miss them on the Wednesday they will be doing several other gigs over the course of the festival. One of my favourite smaller festivals is Endorse-It In-Dorset where the music is geared towards the punk / ska / skiffle end of the spectrum. I’m therefore going to be making a bee-line for Club Dada in Shangri-La on the Thursday evening for the Punk Folk Ceilidh Hoedown, where Endorse-It organisers and cowpunk aficionados Pronghorn head the billing. One area that made an enormous impression on me last year was Trash City with the amazing pyrotechnics and flaming DJ Tower which had an old school rave atmosphere in a Mad Max setting. Arcadia, who were responsible for these attractions last year, will have their own field in 2009 and I’m especially looking forward to spending some time there with my hands in the air for Hybrid’s session on the Friday night. The larger stages of Avalon and Croissant Neuf get plenty of press coverage and rightly so because they both have wonderful atmospheres and great line ups. But smaller Greenfield venues like the Tadpole, One World and Mandala Stages, as well as places like the Bimble Inn in The Park are less well advertised. Some have entertainment programmed all the way through the weekend from Wednesday onwards so I’ll be making sure I spend plenty of time flitting between these places and catching up with old favourites like 3 Daft Monkeys, Biggles Wartime Band, Tarantism, Loonaloop and the Weirdstrings. I’m heavily into what is generically called “World” music and one of the most amazing experiences I have had at Glastonbury was the extraordinary Africa Express collaboration which Damon Albarn brought to the Park in 2007. This year we have an Africa Express Sound System to look forward to so I will be back at Club Dada for this to dance into the early hours of Sunday morning. I saw Speed Caravan at WOMAD last year and they blew me away with their foot stomping set of Arabic / rock crossover music played on the ancient Oud. So if, like me, you are growing a little weary of the seemingly endless stream of indie guitar bands these guys will restore your faith that there really is something new in rock’n’roll. Being a 60’s child Rolf Harris always holds a special place in my heart and he has become a Glastonbury legend over the years. But if you feel his jokes are getting a little tired then pop up to Avalon for the Lancashire Hotpots instead and a spot of Chippy Tea! Easy Star Allstars are doing 3 sets over the course of the weekend and will be playing each of their 3 albums in turn. They came to most people’s attention a few years ago with their “Dub Side Of The Moon” covers of Pink Floyd classics in a dub style. This was followed by “RadioDread” for all you shoegazing fans of Thom Yorke & co. But fresh off the press is their “Sgt Peppers Lonely Hearts Dub Band” and I hope to be up & about in time to catch this on the Pyramid Stage first thing on Sunday. Amadou and Mariam are the blind couple from Mali who have been making excellent Afro-pop music for years but really came to the fore in 2005 with their Manu Chao produced “Dimanche a Bamako”. Their recent “Welcome to Mali” has pushed them even further into mainstream awareness and their joyous sound will be perfect for a sunny Sunday afternoon. Tinariwen are another group who have come out of Africa and become enormously popular in Europe with their shuffling desert blues and traditional dress of the Saharan Touareg nomadic tribesmen. They are appearing on the Pyramid on Saturday but I am especially looking forward to their collaboration with innovative folksters Tunng in the Park. And then finally I’m breaking with tradition. I’ve not actually seen a headline act on the Pyramid Stage since the Chemical Brothers played in 2000 and I’ve never had the opportunity to enjoy the fireworks at the end of the Sunday night headliner’s set. But I’m a huge fan of Damon Albarn, not only for his work with Blur but as much for his projects with Gorillaz and Monkey, Journey To The West and his innovative involvement with Africa Express. So I’m going to get myself down to the Pyramid on Sunday evening for a good old singalong and to hopefully get a few photos of those lovely fireworks over the Pyramid. So those are my plans. Some will come to fruition, others will no doubt end up being binned because I’ll have stumbled across something that grabs my fancy more at that particular moment in time. But whatever you choose to do – Happy Glastonbury! Pictured top: Hobo Jones and the Junkyard Dogs, performing at Endorse It. Photo by londoninflames, Flickr. Shangri-La today revealed their ambitious plan for this year’s Glastonbury Festival, bringing new venues, acts including the Africa Express Sound System, Thursday night music, and an eclectic array of performance artists, all under Shangri-La's 2009 theme 'DYSCOTOPIA'. The HUB, a new central feature of the area, will include a distorted version of an information centre, with "propaganda bursts" from people who "seem to drift in and out of reality". Daytime entertainment at The HUB is provided by the Trans Siberian March Band from Russia, French outfit Le Fanfare en Petard, Orkestra Del Sol, Masters Of The Kazooniverse, DJ Russ Jones, Jason Mayal, Stoke Newington International Airport, and circus performers including big beat percussion, wall runners, tightwire acts and witch doctors. The Continental Drifts team again bring Club Dada, with the Africa Express Sound System in a top Saturday night slot. The original Africa Express - formed by Damon Albarn in response to the lack of African artists at the Live 8 event - first appeared, as a live act, at the festival in The Park area in 2007. For many, the performance was the musical highlight of the festival. Musicians from across Africa, including Malia, Senegal and Algeria were joined by western acts such as Billy Bragg, Norman Cook and Albarn himself. Elsewhere in the Dada line up, there’s a mystery slot cheekily slipped in on Friday night, billed as "Someone amazing but we would be sacked if we told you who", which will no doubt set tongues wagging in the run up to the event. 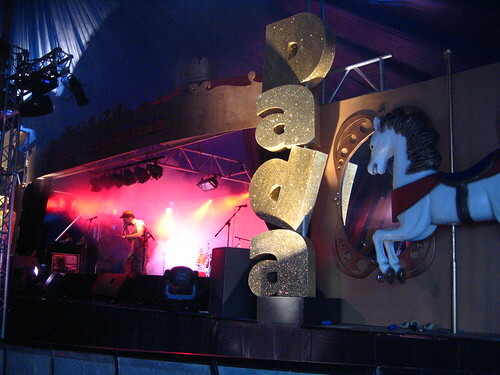 Club Dada's entertainment begins late afternoon Thursday, and on Saturday afternoon – supported by the Arts Council of Great Britain – it hosts Club Attitude for the first time at the festival, with performances from top disabled artists including Deaf Rave and punk band Heavy Load. Bassline Circus is back too. By day, expect a performance arts centre and cinema, with interactive installations, films, and fun and games, hosted by Glasgow’s Lowsalt and Autonomous Arts from Manchester. In the evening, Bassline moves up a gear and onto the beats, with a mix up of DJs and performance acts. ”Top underground DJs, MCs, bands and the best of the New School circus crews connect the threads of the UK and European scene. DIY Smokescreen ATG crew London City Soldiers, Mr Psik Jstar plus more” say the Bassline crew. By night, the music and performance theme continues. The line up will include Daddy Freddy, Jungle Drummer vs DJ Fu Wax, Inferno Bobby Friction and The Insiders. New in Shangri-La this year is the Snake Pit, with a no-tattoo no-entry policy (and yep, if you lack the requisite skin job, there'll be a tattoo parlour ready to sort you out.). The Snake Pit will have stage shows and exotic cabaret. The organisers say it's a "glam dress code" thing, too. So bring your glad rags, and hope the sun shines on a mud free Pilton, just like the Met Office has said it will. Probably. Slumbarave reappears, with four-poster beds, an indoor spa and the Jacuzzi Lounge. Slippers and dressing gowns will be laid on, and guests can expect game weirdness such as "Mono Slipper Racing" (no, me neither) as well as late disco action from Absinthia and the Laundrettas. Old hands of the Glastonbury late night area - Phil's Deluxe Diner – will be in Shangri-La again, with round the clock food, cocktails and DJs. And if that lot isn’t enough, there’s a myriad of other attractions, rounding out the largest of the late night areas at the festival. Places include Come and Play, Area 51’s Underwater Lounge, Madame Nazreens Fortune Telling Booth, Gramophon Salon, Peoples Front Room, Smash and Grab, Temporary Autonomous Artists and Igloo. Look forward to some strange days, and stranger nights. 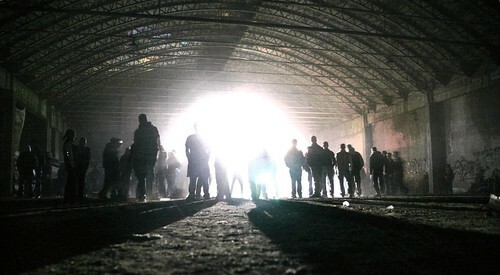 23.00 - 00.00 Deathray Trebuchay – Frank Zappa on acid meets a East European film set. Afternoon: Magpies Nest – Absolute masters of the new UK folk and acoustic and bring us their best . 15:20 - 16.20 The Long Notes - Folk traditionalists with a dynamite twist. 00.20 - 01.10 Surprise Superstar Guest - Someone amazing but we would be sacked if we told you who. 03.00 - 03.45 Blackberry Wood – From Canada a Bonzo dog. 04.10 - 05.00 Warlords Of Pez – They are simply insane, from Ireland, something very surreal and punky. 05.00 - 06.00 DJ Head Gardener – Captain of the Secret Garden Festival and top enigmatic DJ. Day: CLUB ATITUDE: Attitude is Everything have been at the forefront of disabled access to festivals for years, here a whole afternoon of the coolest bands from their community. 18.00 – 19.00 Peyoti For President - Latin Manu Chou-like conquistadors of political punk. 18.50 - 19.40 Brothers Bab – Jumping ska and Latin funksters. 21.40 - 23.20 Le Vagabond Boogaloo Club – Gypsy dance and cumbria DJ s from Hackney. 00.40 - 01.40 Orkestra Del Sol – Scotland’s answer to a Serbian Speed Brass band. 04.15 - 05.00 DJ Tofowski – Tofu was born and bred in the mud of this field. Gypsy beats. Comperes include Des Occonor, Chris Tofu and Mandy’s Cousin. The geezers of gas are back - in a field of their own. After the dust settled from 2008, with the Jay-Z debates finally laid to rest, it was a field in the festival, not an act, that remained cemented in many festival goers minds. Any random sample of opinion would bring up the same verdict... Trash City was the enduring memory of those late, lost nights, a world away from the headline grabbing acts. 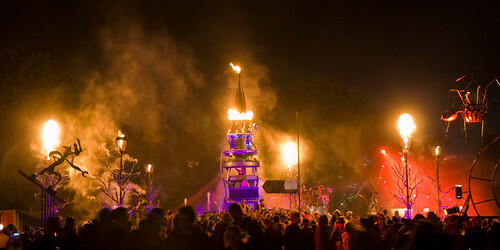 The backdrop to the storming success was Arcadia Spectacular, whose flaming installations lit up the night sky as part of the "Apocalyptic Rave" in the late night corner of the festival. This year they take a well earnt step up, taking their own field just across the track from Trash City. At the hub is the Arcadia Stage, featuring the fiery After Burner DJ tower. Strummerville, founded after the death of The Clash lead singer Joe Strummer, are reassuringly again in their usual spot, near the memorial Strummer stone behind the Arcadia Stage. The Arcadia field will also feature the Invisible Circus (we assume they will be visible, somehow), crumpet based foody niceness from 'The Strumpets with Crumpets', the 'Hemp Space', and a handily placed bar. Also in the field expect to see Arcadia's Flaming Trees and Victorian Lamposts. Although the Arcadia name is seemingly new, it's not been a short ride. Partners Pip Rush and Bertie Cole have enviable pedigrees. Pip's career began when he was "crawling around explosive Mutoid parties whilst still in his nappies" and went on to learn the craft of welding, to then turn it into art. Bertie earnt his stripes as the tent master for the company that supplies the mammoth Acoustic Stage at the festival and many other events worldwide. Arcadia has rolled out their wares at several festivals including Ireland's The Electric Picnic and the UK's Beautiful Days. It's at Glastonbury however, that they have revealed their full glory. "We've set ourselves some big goals", Bertie said, ahead of revealing the plan to us tonight. We await the flames. They await the gas bill. In this area, in 2008, the music license was until 6am, with an a hour earlier for the bars. Like the neighbouring Trash City and Shangri-La, expect Arcadia to be rammed in the peak times after the main stage headliners finish. Our tip to avoid the crowds: Go early, or very very late. Photo by Russ Garrett, Flickr. Used under the Creative Commons License. The landmark Left Field tower will appear again at this year's festival, despite the absence of the Left Field organisation, GlastoEarth has learnt. We spoke to Rob Floyd, a partner in Pro-Weld Fabrication who led the engineering of the tower, about its inception in 2004 and its future. Appledore shipyard had been earmarked to the do the engineering, but had then collapsed. "My partner Rich bumped into one of their shop stewards in a pub... he wondered if we could help with the tower." 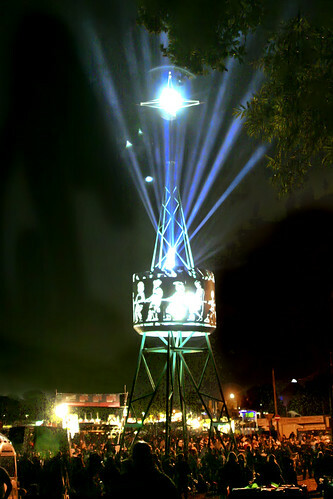 The engineering of the tower - designed by artist Graham Jobbins - was subsequently rescued and led by the Pro-Weld team. "The Workers Beer Company [WBC, union backed founders of the socialist campaigning organisation, The Left Field] asked us if we'd use union labour... we said yes... and rented a new factory unit to build the tower". The tower became an iconic feature of the festival site, with it's projecting beams visible across the valley throughout the night. 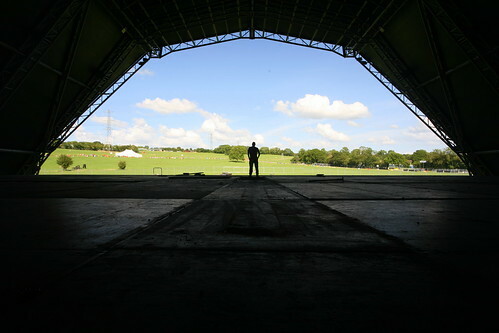 Late in 2008 however, following the surprise announcement that The Left Field wouldn't be appearing at the festival in 2009, the tower was set to disappear. "We recieved an email from WBC... There's no Left Field, no Left Field tower". The absence of the organisation caused consternation with some hard-core festival fans - feeling it showed an erosion of the festival's cherished values. The Left Field subsequently announced a new focus, staging an event in Texas for Billy Bragg's Jailhouse Doors project, bringing music into prisons. The tower however, has now recieved a reprieve. "We got a call from Graham... he'd had a chat with Michael Eavis, and Michael had said yes, of course we're having the tower", said Rob. Now it's full steam ahead for the artist and the Pro-Weld team, who expect to be erecting the tower later this month. "It'll be in the same place... it can't go anywhere else unless we sink another four tons of concrete!". The build team will include Bill Burroughs, designer of the current Pyramid Stage structure. It's not yet decided whether the Left Field lettering, at the top of the structure, will remain. Rob, nonetheless, was talking about the future. "One idea is to make a stage underneath... like a bandstand". With the tower living again, Left Field fans can perhaps have hope that the organisation and the festival will work together again. And for those with less lofty ideals, it is, of course, a beacon of navigational hope when too much cider means all else is lost. The Left Field tower is featured in the GlastoEarth Map, in the Bonus Features' 3D layer, modeled by Chris Harbour with the kind help of Pro-Weld Fabrications.